Juno is not going to happen today. But thankfully, rest is. I decided not to stress about tracking down that elusive orange and white striped shirt. It was too much work, and I would rather save my energy for labor. The baby room is finished, except that we need to get his changing table moved in under the window. But that’s minor. His clothes are organized, thanks to my dear friend, Kim. His mural is jungly, colorful and splashed all over two of the walls, thanks to Jazzy. His crib is sturdy and built, and his dresser is a delightful monkey brown, thanks to my husband. And thanks to me, baby is cozy and safe in his domed incubator. For how much longer I do not know. I only know that I’ve been telling him for a while he cannot wait until after Nov. 11. Now I know why – my OB will be pheasant hunting and I would much rather not give birth with the to-be-announced on-call doctor whom I’ve never met, thank you very much. 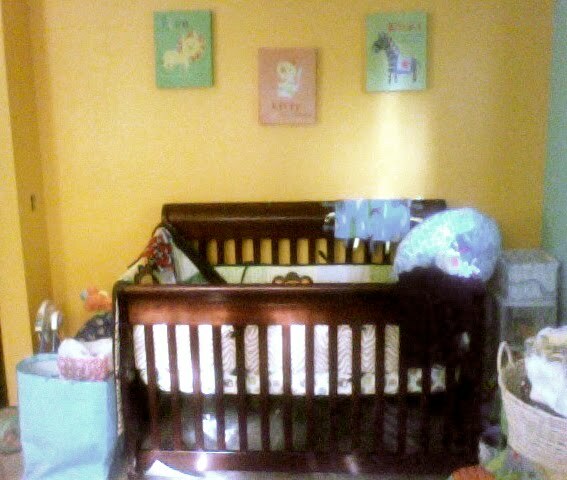 Here are a few baby room pics to satisfy your curiosities: The crib: thank you, Josh. The dresser: thank you, Kim. 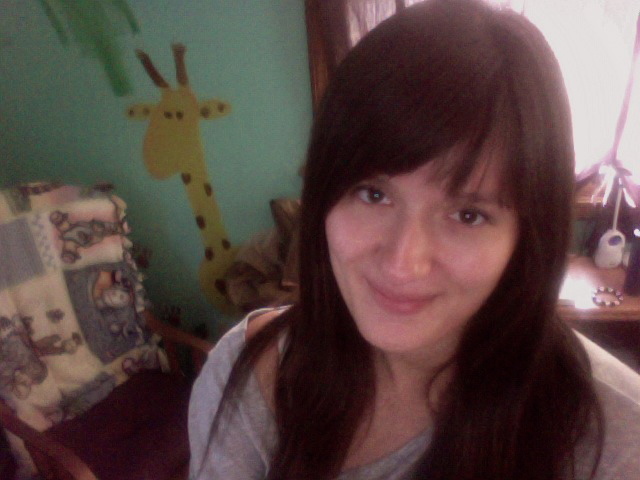 Me in front of the glider, thanks to Linda (my mom-in-law) and a happy yellow giraffe, thanks to Jazzy – I spend a lot of time in this corner of the room, taking in the color and the silence and the idea that one day soon, a baby will occupy this little space. Can’t wait to see his face and snuggle him up close. This is me today, baby still tucked up high despite my efforts to walk him down further into my pelvis. He will drop when he is ready, and I guess I can thank him for delaying my waddling. I do waddle, but not unless I’m tired. If you look closely, you can probably see that my belly button thinks the baby is done. So it’s only a matter of time. I visited a photo blog today with the story of a beautiful home birth. I cried. I always do. I’m not having a home birth, but I am aiming for a natural one, and there is something so compelling about the strength of the woman in labor. Especially one who decides to go through the intensity of naturally birthing her child. I swear it’s not the sense of martyrdom that inspires me. I just feel I want to do this, even though I can’t fully explain why. 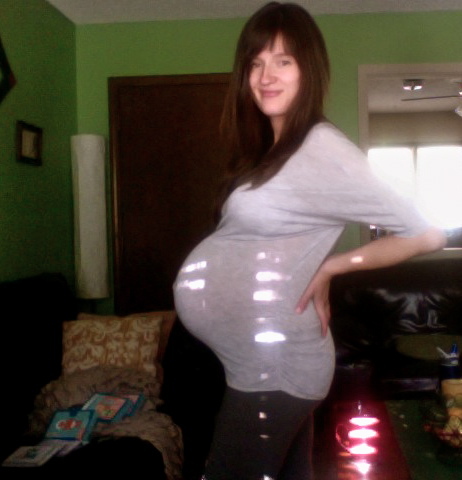 So I’m prepared for a natural birth mentally, but emotionally, my goals are happy and healthy baby and mama. And I will do whatever I need to do to get that. As for my goals to rest and enjoy myself and the last few weeks pre-baby, I think I’ve done fairly well. I was falling apart-ish on Thursday and Friday, but mostly because I was tired and four ten hour days in a row with long nights to boot is hard on a girl. Especially girl with 25 extra pounds condensed somewhere in her mid-section. Yesterday was beautiful though, rejuvenating. Walked in the park with Alison, then Kristen cut my hair so that it’s light and swaying again. 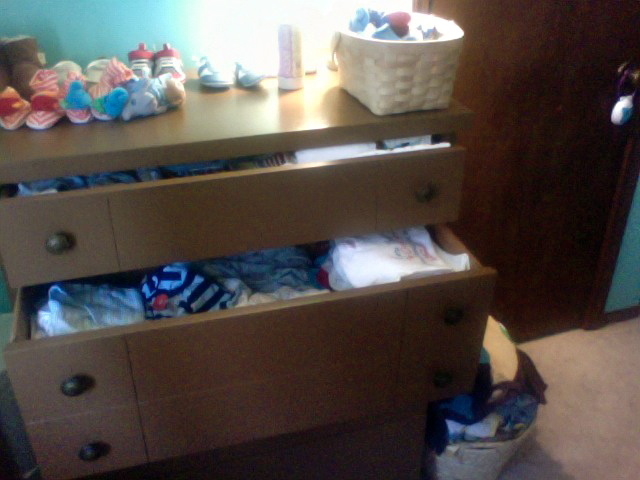 Kim came over with 3 month old Luke and helped me organize my baby dresser, which I had made to be an insurmountable task. She proudly stood next to each finished drawer and admired her work, and I couldn’t help but agree. Tiny onesies and shirts and sleepers, set in rows according to age and size and type of clothing. I will never cease to be impressed by people who enjoy organizing; I hope to always have them for friends. I believe you and I can all expect our tiny, adorable addition to arrive within the next 8-10 days. Please pray that he does, and pray that I will continue to walk in this beautiful surrender and soak up the grace available for every moment. Wow, look at your cute basketball! I don't think you gained weight anywhere else. Okay so my guess for when he comes was November 12th but looks like that would just be mean to guess that. God's going to bring him into the world safe and sound! No worries! Glad you're not uncomfortable, that must help a lot in the waiting process. I can't wait to see pics of the little guy! Holy cow he's up high! Is it hard to catch your breath sometimes? I remember when Sarah was that high I felt like my lungs were so smashed. I'm guessing the 10th for some reason. You're so close!! It looks like everything is ready to go. You still look amazing!